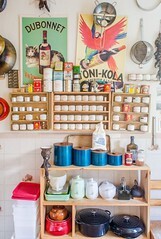 Kitchn Tour: AEB HQ, rev. ed. We've provided you with plenty of glimpses before, of course. But have you ever wondered what an outsider's perspective on our beloved AEB headquarters would look like? Well, here's your chance, because the good people at TheKitchn have posted an extensive tour + an interview with Michelle in this week's editions, as part of their ongoing Cook's Kitchen series. Michelle dishes on a wide variety of topics--minimalist tastes, maximalist collecting, baking, home cooking, epic dinner parties, etc.--and TheKitchn's camera-eye examines our kitchen and dining room to see what secrets they may hold. You can find the whole she-bang right here. 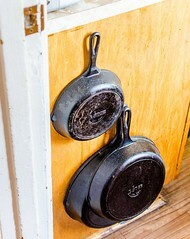 And if you find yourself with lingering questions about our collection of cast-iron, well, those get answered here.